Café games such as Café World have been on Facebook for sometime and Café Life follows the same basic formula of creating dishes for your guests. You have both a coffee machine and a stove to create treats for your guests. Your finished products are served from display counters in your store. Tables and chairs can added to your café so your guests have a place to site while enjoying their treats and your Facebook friends can be hired as servers. Each player has a full range of decorative options for their café to give it a nice look and feel. This game has a great menu already with eleven pages of goodies you can serve your guests. Treats include cakes, éclairs, muffins, assorted cupcakes, tarts and other items. The selection is good but a little too heavy on the cupcake variety. In addition to treats you can also serve coffee items such as cappuccino. Like many café style games on Facebook the items will expire if you don’t serve them after they’re ready. The game has done an excellent job with the amount of items you can serve. Your café can also be customized with various items such as tables and chairs for your guests. You’ll find doors, windows, wallpapers, flooring, and plenty of decorations to give your café a nice look. Themed items are available such as those for Halloween which will cost you either coins or Facebook credits to purchase. This game looks very nice for a Facebook game. The avatar heads are a bit big but the are bright looking with clear graphics. The graphics in the game are in fact very good for a game such as this and a real highlight of this café game. The soundtrack is mellow and fit’s the game perfectly without being annoying like the soundtracks of other Facebook games. The game also runs smoothly with hardly any disconnects or server resets and doesn’t annoy you constantly with excessive popups that plague Facebook games. My only complaint is that the game play area is a bit small to work in. The interface menus are easy to work with and won’t confuse you like some others games do. Some quests would be nice to add to the overall game play experience. Avatars can be customized with new hair, faces ,and clothing if you don’t like the default one. 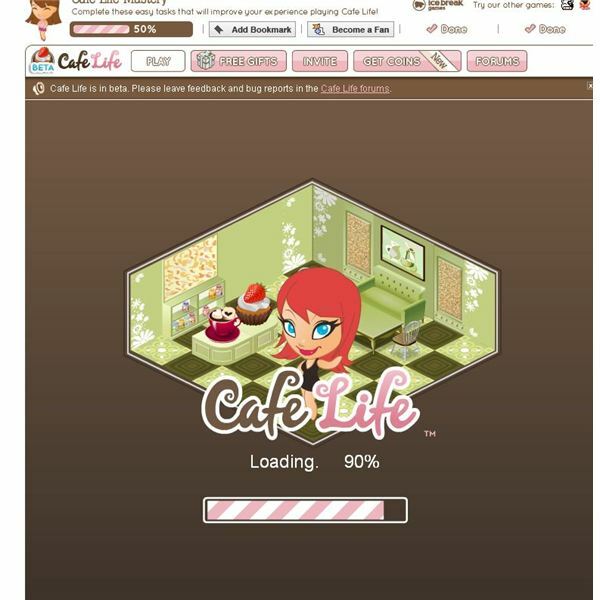 Café Life doesn’t offer anything new to the café genre on Facebook but it looks really nice and it’s easy to play. You won’t get annoying popups or requests to add Facebook friends. There's plenty of recipes and fun items to add to your cafe. The game could use some quests for added game play but overall this is a game worth playing if you like the café genre in general.